Dr. Kevin McCartney, Professor of Geology at the University of Maine at Presque Isle, has published an article in an international journal that describes a new genus and three new species of silicoflagellates, a single-celled algae that lives in the oceans. This research developed from work that McCartney has done over the past 30 years. In 1988, McCartney discovered the oldest known silicoflagellates, which lived some 115 million years ago. This work developed in the description of a new genus and new species. Five years ago, McCartney discovered a rich assemblage of new fossils in sediments from the islands of northern Canada, which resulted in additional new species and a new genus, Umpiocha, named after his university. The recent paper is titled “New insights into skeletal morphology of the oldest known silicoflagellates: Variramus, Cornua and Gleserocha gen. nov.” and is published in Revue de Micropalaeontologie, a journal based in Switzerland. Jakub Witkowski from the University of Szczecin in Poland and David Harwood of the University of Nebraska are coauthors to the study. 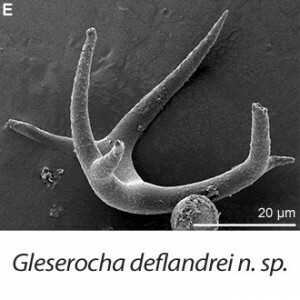 In this paper, McCartney has interpreted a new genus, the fourth genus that he has described, which he has named Gleserocha after a Russian scientist. He has transferred two already known species into the genus, and added a new species to it. The new genus provides a better knowledge of the early evolution of silicoflagellates. McCartney has also described two new species for another genus, Cornua.